Yum, and without enough salt and extra fat to kill a person! Serve with fruit, which for most kids has to be on a separate plate because foods can’t touch and otherwise they won’t finish without using less than 7 items for you to wash. In L.A., at least, you’ve got your kids for the next entire week because of Thanksgiving week and no money in the county coffers. They’ll be sick of sandwiches by Tuesday. 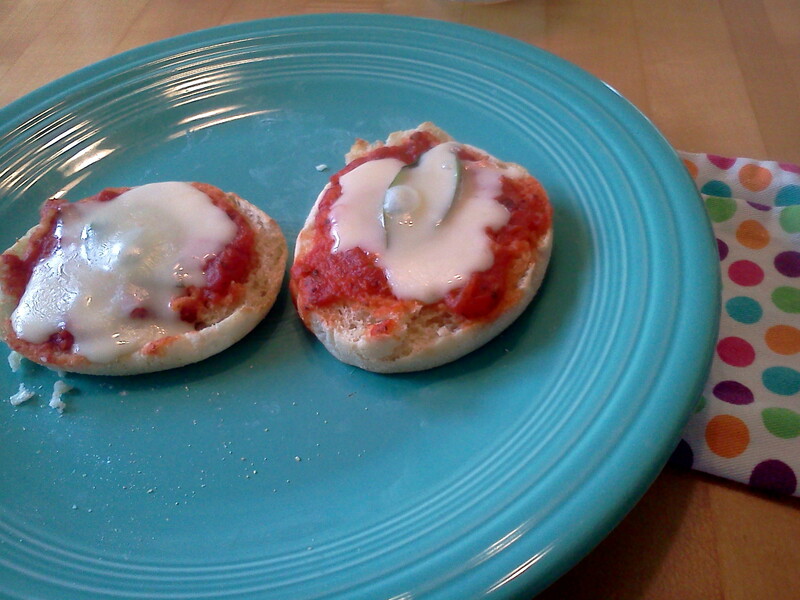 It’s not brain surgery, nor is this the first time any parent hasn’t heard about making little pizzas using English muffins. But the 9-year-old suggested it for her lunch on this rainy day, and she was so proud she made it herself I thought I would leave a few tips for parents (and um, college students… and um…). 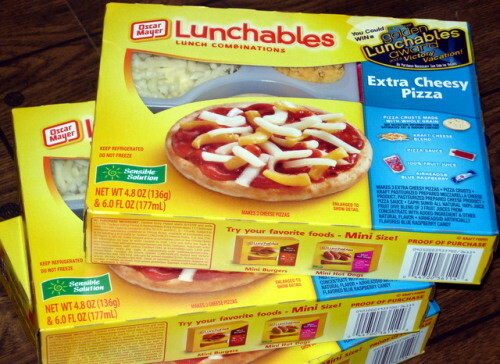 If this will keep you from buying those abhorrent Lunchables pizzas, my work here is done. 1 plastic knife, ours are from Ikea. This is how your kid gets to keep all of his/her fingers. Our kid is obsessed with using the microwave, so I let her defrost the English Muffin for 25 seconds on high. She split the thing with her Ikea knife, and cut up the cheese. I doled out tomato sauce into a little Pyrex, and she spread it herself. She plucked a couple basil leaves from our nearby plant, placed them atop the tomato sauce, topped that with cheese, and I placed the tray into the oven set at 350 degrees F. It took all of 3 minutes to melt the cheese and make the muffins lightly toasty. Hey parents, YOU remove the pizzas and get them onto the plate! The kid declared them delicious, and so much better than the Lunchables pizza she insisted trying exactly once. Snack bags filled with tomato sauce. Keepin’ it fresh. 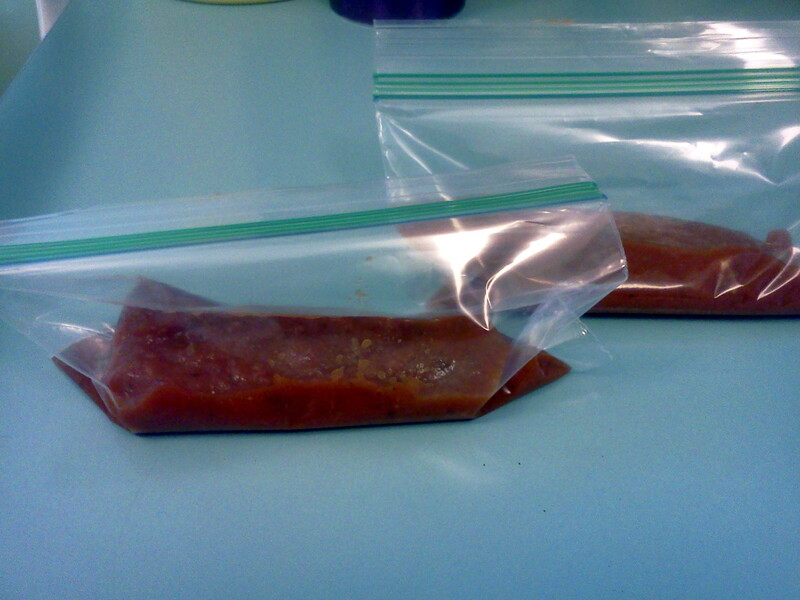 For next time, I am freezing two snack bags containing a few tablespoons of tomato sauce each, along with two sandwich bags containing the rest for use with pasta. You an also line an ice cube tray with plastic wrap and freeze cubes of sauce (once frozen, place them into a gallon Ziploc and use as necessary). Don’t place Ziploc bags onto the wire shelves of the freezer because the sauce will sink between and may become stuck; place then on the shelves of the door until frozen. To use the stuff, turn the bag inside out and the frozen mass will easily release. Then my kid can microwave the sauce and make her own lunch while I ponder the state of humanity or the meaning of life or how I’m going to get into a mall in the next month without being swept off my feet and carried by the crowds into the next county.